Change you space… Change your life! For years I have been helping clients around the Los Angeles area get rid of the clutter and belongings that no longer serve them. But what about personal keepsakes that could still bring joy but are inaccessible and unusable, specifically, the videos and photos rendered obsolete by our fast-moving technology? Some of you may know that my sister is not well. Her battle with cancer has been devastating, and she will never be the same again. I don’t want to live in the past, but I desperately want to watch the home video of us from when we went to Hawaii. Of course, it is a VHS tape and I don’t own a VCR anymore. I know why I’m keeping it, even though I cannot watch it, and that is the spark for this blog post. 1 - Converted all VHS tapes into iMovies on my external hard drive. 2 - Transferred all CDs (old photos and headshots) and DVDs (old short films from my acting days) onto my external hard drive. 3 - Transferred all items on my big, old, heavy hard drive to my sleek, new, mega-memory G Drive, then cleared the antiquated device so it could be donated. I now have all my “stuff” in/on a 4.33” x 3.23” x 0.43” box/hard drive and can access it anytime I want. 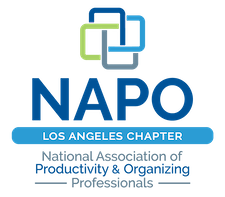 Jeremy and I at NAPO-LA’s Monthly Meeting. 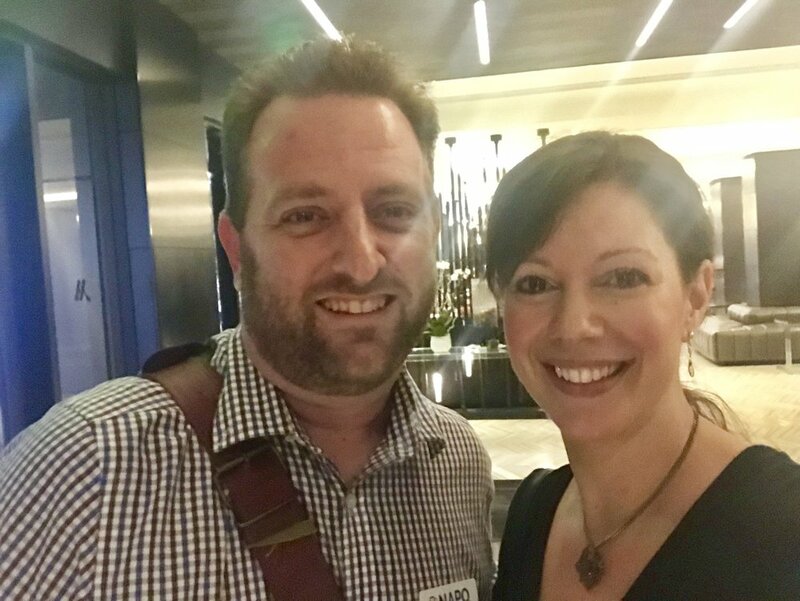 How it works…I called Jeremy and he met me at a Starbucks in the Valley, (which was closer to me then his office), where I handed over my precious items. I have to say, when he was walking away with all my memorabilia I had a pit in my stomach thinking, what if he never comes back?! To put my ‘fear of lack’ to bed, Jeremy did in fact return 2 weeks later with all my “stuff” on my G Drive. I paid him a very reasonable fee through Venmo and we parted ways. As soon as I got home I plugged my hard drive into my computer and cried like a baby watching the video of my sister and I from over 20 years ago. I couldn’t have been happier. My sister and I in Hawaii, early 90’s. Cautionary tale: Jeremy told me that had I waited any longer, the tapes could have deteriorated and the footage would have been lost forever. I am so grateful I have a physical reminder of a magical memory with my sister. If you have memories that brings you joy, I urge you to digitize. Whether via hard drive or uploading to your cloud, you can keep more stuff in less space, and have it in a vastly more accessible way. Less clutter, more joy. Win-Win! I’m thinking this would be a great gift this holiday season: a gift certificate to I.O.Solutions! Don’t let the past clutter up your present. I hope you create new wonderful memories this holiday season with your family and friends. It’s finally summer and feeling like it in Southern California. Not to complain, but it has been cold here in SoCal; Los Angeles is always sunny, but brrr. Anyway, the first hot day arrives and of course, we're clearing out a garage. Fun Finds in the Garage. 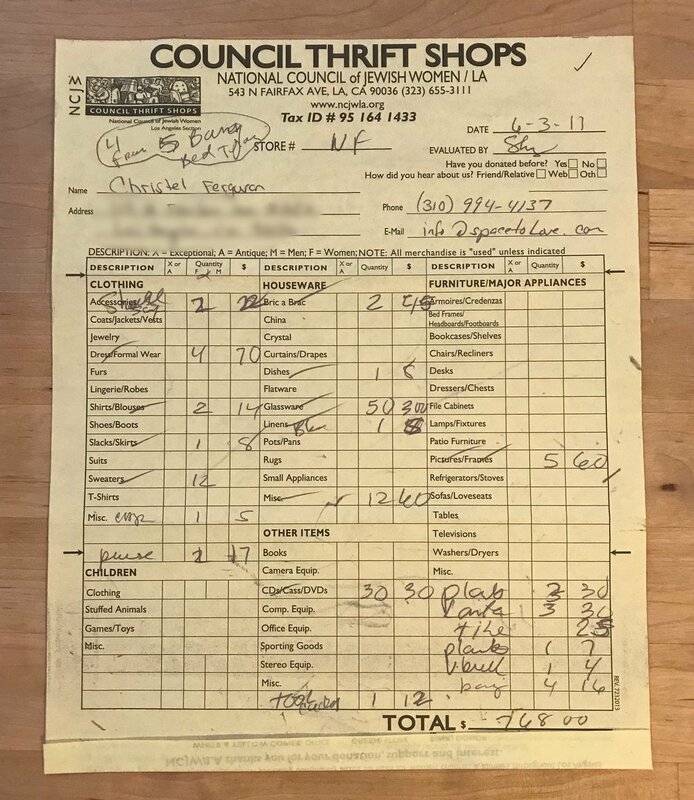 My clients' miscellaneous items have been nonpaying tenants of the garage since they moved into their home many years ago. I see this cluttered storage issue all the time, so here's a pro hint: when we store stuff in the garage/attic/crawlspace to be sorted later, for that magical "I’ll get to it when I have more time," time, it’s a good sign the items may never see the light of day again. The organizing part of this garage gig was easy, considering there were really only a few items my fab clients wanted to keep: a few nice pots and pans, family heirloom fancy glasses, some long-lost decor that is finally going to be used, and some items that belong to other family members that need to be returned. From there, we donated what we could, and then called 1-800-GotJunk for the rest. Presto! Space! Before and After of One Car Garage. We made room just in time for some summer fun in this garage... A new Mercedes! Happy ending for my clients, but what if you actually use those DIY / gardening tools and yard equipment? If you own a house and have kids it is a whole different ballgame: baby strollers, beach gear, camping supplies anyone? What about winter ski storage and holiday decor? How about bikes, helmets, scooters and surfboards? Whatever the sport or season I’m here to help sort and purge. 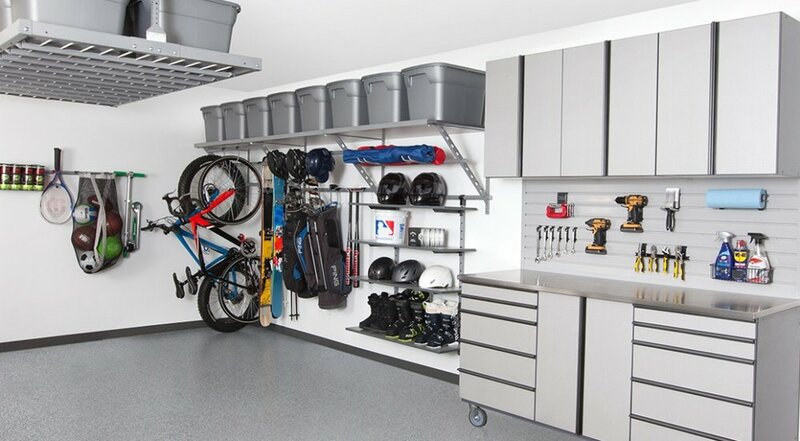 Once we figure out what is leaving your space, we take a look at what's left, and in the case of garage storage solutions, we call the experts. This is where the fun begins. I love partnering with monkeybarstorage.com an amazing garage storage systems company. The local LA location is who I will collaborate with and figure out just how many bins and hooks you will need to fit all your sports equipment and baby gear for your growing family. Presto again! So whether you're an outdoor junky with an extreme sports habit, an active family on the move, or finally getting that dream car, take a look at your space and then give me a call. Together let’s create some more space to love this summer! I feel like I'm hearing that word, "downsizing," so much more these days. The mono-word turn of phrase is getting some social acclaim as of late, and as a de-cluttering pro, I can't help but do a little happy dance every time I hear or see the word in public. Example: A few weeks ago, I had the pleasure of watching an advanced screening of Matt Damon's new film Downsizing; what a great movie! If only we could shrink down our trash like those brilliant Norwegian scientists! My head was spinning from the imagined possibilities. Then the word popped up again! This time in a book title from one of my favorite people and clutter organizers, Peter Walsh. His new book Let It Go, Downsizing Your Way to a Richer, Happier life will be in my hot little hands come January at the event his is hosting for NAPO-LA. Practice what you preach: I did some serious downsizing myself over the summer. I moved from a 1000 sq ft, two-bedroom apartment, to a 400 sq ft studio, because "why-am-I-in-a-two-bedroom-apartment-when-it's-just-me-and-I-can-move-to-a-better-neighborhood-for-half-the-cost?" was a question that plagued me for a good six months. I didn't have room for the question anymore, and it was time to let go - of it, and my possessions! I got rid of 75% of my stuff! Me! I'm already a minimalist by most people's standards, but even I was surprised at what I didn't truly need. So, what did I do with the 75%? I decided to have a yard sale while I was downsizing. My clients often ask about hosting a yard sale with their purge, and having never done one in Los Angeles, I believed they deserved a first-hand account of the hassle and shenanigans involved. To give an honest answer from someone who's "been there," I decided to endure the process. And document it. For posterity. You're welcome. Spoiler: We may have had fun making the video. 1. Sort and stage - Here is where the bulk of the work comes in - good time to call your friend or family member (or trusted de-cluttering professional, ahem) over for the often overwhelming decision-making portion of your downsizing. Going through all of your belongings can be daunting to say the least, and I highly recommend the buddy system when going down the dark path to clutter freedom. If you have a garage, use it! The separate location can be a great staging area for your former treasures, plus you get the unwanted items out of your space sooner. Unfortunately, I didn't have a garage to keep things in neat, like-item'd piles, so I made due by opening up my organizing tables in my living room, and I stocked them with the goodies I wanted gone the night before the big event. Setting up the night before made the following early morning pretty easy; we just carried the tables out onto the lawn, ready to go. 2. Price - how to price it can be tricky. No one is going to pay what you paid for the item, or even what it's worth, so let that fantasy fly away with your limited-edition left-handed Frisbee. If you paid $100 retail, you'll be lucky to get $10 for it at the yard sale. (Side note, this part is sometimes painful, especially if you're forced into downsizing rather than choosing it. Haggling with strangers over possessions you're forced into giving up can be a truly horrible experience, and to me there is nothing more hurtful than feeling devalued. So going in, know this, you are not valued by your stuff-don't take it personal!) Use the round stickers to price everything out. I priced things out for a few dollars each, knowing people would talk me down. Speaking of down, get your wares off the ground; take care to place items on a table or blanket. I happened to have a clothing rack which came in quite handy for displaying my former wardrobe. 3. Advertise - Place an ad on Craigslist/your local paper, and put up signs in your neighborhood. 4. Get change - You will need some cash to start. Get $1's, $5's and even quarters. Yes, it will come down to change. 5. Have fun! It's going to be a long day, might as well make the best of it. Make a video:) and it wouldn't hurt to have some ice cold Coronas on hand; your comrades will thank you. The outcome from my yard sale experiment: It turns out that I didn't have a lot of the items people were looking for at yard sales. Many would-be patrons came early, between 6-7am, looking for electronics, microwaves, jewelry, gold/silver, and men's clothes. If you're dripping with these items then I say go for it! Put on that yard sale and make that sweet sweet cash. As for me....I made a whopping $48. Not everything sold at the yard sale (go figure). I ended up selling the larger items on Craigslist and OfferUp, which yielded $555. Adding the yard sale's $48 totaled me out at $603. But wait; there's more - I donated the remaining items to the National Council of Jewish Women and got a tax receipt for $768. Downsizing = Worth it! Yard sale = Not! - Hindsight is alway 20/20. I would have saved myself (and my loving pals) a lot of time and effort if skipped the yard sale and sold my stuff on Craigslist/OfferUp and donated the rest. I would have, but now I can authoritatively say that unless you have the right items, yard sales are not worth it! Again, you're welcome! Yes! Clean out that storage closet once and for all. I just helped a client do this, and I want to share a few things that might be useful for the closet you have been ignoring... and the skeletons inside. My client had recently moved, and didn't have time to purge or organize before transitioning from old place to new. As a result, her storage closet was riddled with random items (because it had a door to close and hide it all behind). Sound familiar? Well, it happens all the time. Time to reclaim your space! To get started, take everything out of the closet. As you remove items, sort them into piles with similar types of items - put like items with like items. 1 - Items that are not working in the new (or current) space. This is often a frustrating endeavor, but it's time to realize that even alternative facts won't make your drawer organizers from your last residence fit your new space, and those pictures that looked great on your former living room wall don't catch the light in the same way in your new (or now) house. Yet, these items get tucked away in the storage closet in hopes you will find someone to give it to or eventually sell it. A big crutch in the letting go process is the "waiting to give it to someone who will need it" crutch. We always want to help someone out (or in some cases, pass the obligation of the item onto someone else), but then the unwanted item ends up chewing up valuable real estate in your space for way too long. So go ahead, give yourself permission. Donate it. And those things that need to be returned that didn't work for the new space that got shoved in the storage closet to collect dust and be forgotten? Put them in your car with the receipt and make sure it gets returned before it's too late. Or donate them. 2 - The eBay and Craigslist pile. My client had fancy and pricey dresses; some still had the tags on them, plus other items she thought could be worth selling. Of course, I'm all for donating it. Too often the ideal amount you think you can get for a given item is a lot more then what you can actually get for it. With my client, we started looking up how much similar dresses were selling for online and found that they were going for $20 or $30, and some were being stolen at $10. So I ask, how much is your time worth? $10/hr? $20/hr? Because the time you use listing the item, the time spent in sale limbo/haggling with a stranger, the time and energy physically exerted in shipping the item... is the sale really worth the trouble and your time? I suggest establishing a minimum listing item price of $50 or more to make the listing worthy of your time. If you can get at least $50 for an item, then list it. If not, donate it. 3 - The pile of packing supplies. It will be easier to let these items go when you realize you are donating most of the stuff you thought you were going to sell. The act of breaking down empty boxes from deliveries alone (ahem...amazon) will reclaim a significant amount of space. 4 - The bag of bags, or should I say the whole closet, considering how they seem to fill up space like some magic growing jello. Like many people, my client was keeping every bag that was ever given to her, and all the ones she paid for like the ones from Ikea, etc. We looked through them all, and kept a select few that were in good shape. We used some to bag donation items, and, get ready, donated the rest. How many shopping bags does one household need? If you go shopping and use about 5 recycled bags, then keep that amount in your car, and get rid of the remainder. Rest assured, more reusable bags will come into your life; someone is always giving away a free bag. Oh! And if you get paper and plastic bags every time you go to the grocer's and keep them for trash, then take one bag and fill it up with other bags; whatever doesn't fit in that one bag, you recycle. You will keep getting more every time you go shopping; have faith that you will not run out. By focusing on items in these 4 piles, and not worrying about the organizing part yet, we saw a huge difference in reclaimed closet space. My client even had drawers in the closet that (I didn't know she had) she could never get to, now ready to be filled with items worthy of storing. So, what can you donate today to win back your storage closet? First off, many people buy things in bulk. You may be one of those people. "But it was such a good deal" you say, as we are throwing out the oversized, expired containers of ketchup. Here's something to consider when buying at a wholesale/warehouse store: say you like tuna, and you eat it about once every one to two weeks, so you buy the package of 24 cans and get a great deal. But here's the rub: those cans will be in your pantry for the next 6-12 months. You may have the space for the tuna, but for larger bulk items this starts to max out the pantry in no time at all. For items with a shorter shelf life, you may be wasting your money in the long run, and for the average household, many sundries are unnecessary in bulk. Solution - When buying in bulk, ask yourself how long it will take for you to consume the whole thing. Will it expire before you use it? Do you have the room to store it? Example two: you receive monthly orders of hair and beauty products delivered right to your door. For instance, from my own personal experience is Wen hair products and Cindy Crawford Meaningful beauty. I remember being excited to start using these products, but come a few months later I was surrounded by enough cleansing conditioner and under eye cream to last me over a year. So I called to cancel and they did everything in their power to persuade me not to. After another month of smaller shipments, I finally stood my ground and canceled, knowing I could always start up again if I wanted to. However, some of my clients don't realize that they never canceled in the first place, and are still paying for and receiving products they don't use anymore. This extends beyond beauty products; another client had water delivered faster then they could drink it, and giant jugs were swallowing the living room. Don't forget about those magazines you're not reading. Sure, a magazine doesn't occupy that much real estate, but I bet I don't have to tell you that they stack up quick. Solution - Keep like items with like items; that way you realize how much you have and how much you're using. If it's too much, then call and cancel the subscriptions. The convenience of automatic delivery is not always the best. Solution - Find a home for everything in your home. This takes time but in the long run you will save yourself time, money and aggravation. Lastly, and perhaps the hardest, you don't want to throw out something you paid a lot of money for, yet you don't like it and will never use again. It's hard for my clients to put that piece of clothing in the donation pile that still has the hefty price tag on it, or throw out the expensive makeup they only used once but wasn't their color. At the time of purchase it was a good idea, but now it is a good idea to get it out of your space. If you don't love it, lose it; whether you donate, recycle or sell it, you will not regret letting go of things that don't serve you. Solution - Don't hold onto things because of their monetary value. Know that every item in your home holds energy, and items you don't love could be costing you a lot more then they're worth. The silver lining to this is, while working with my clients during the de-cluttering stage of organizing, they start to visualize their spending habits vs. their consumption habits. After this, they are changed forever. Now, they make better decisions about what to buy in bulk; they know not to buy another white t-shirt because they know where the 7 they own live, and they can better choose what periodicals actually need to show up at their doorstep. Stop the clutter before it starts. Or start stopping the clutter. Watch Christel's Organizing Tip Clips! Sign up for my blog and to hear about upcoming events.